Welcome, friends, to Week 2 in the book of Leviticus! Last week was amazing, wasn't it?!! I can't wait to dig into Chapters 6-10 of Leviticus with you this week. So let's get started! 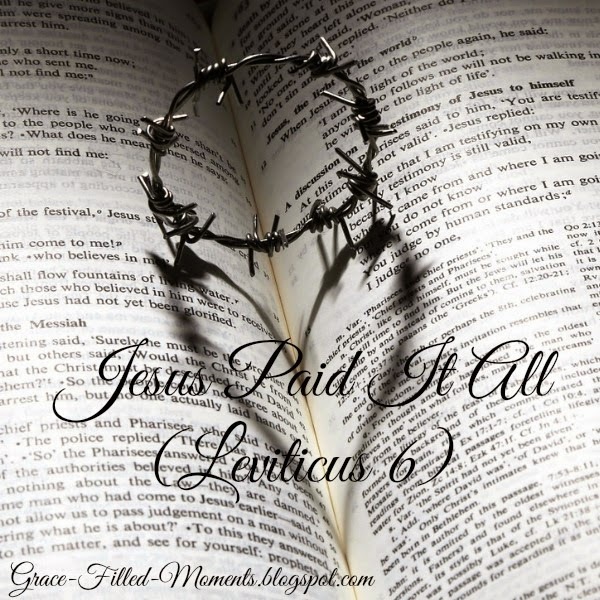 Jesus paid it all for us my friends! His perfect and sinless life was the final atonement that paid a debt we could never pay. This week as we read more about the Guilt, Fellowship, Burnt, Grain, and Sin Offerings we will see a foreshadowing of Jesus Christ through it all. It truly is a beautiful picture of the finished work of Christ on the cross! We will also be reading about the ordination of Aaron and his sons, the beginning of their priestly ministry, and sadly we'll also read about the death of Nadab and Abihu. Here is my SOAK today. I would love to hear your thoughts about Chapter 6 in the comments below so please feel free to share. Verses 1-7 discuss the third type of sin requiring a Guilt Offering – trespassing against a neighbor’s property and rights. In addition to bringing their Guilt Offering to the priest, the offender also had to make restitution in full, plus add a fifth of the value to it, and give it all to the owner on the day they presented their Guilt Offering. The other two types of Guilt Offering were discussed in Chapter 5 and they were misuse of the Holy things of the Lord and sins committed unintentionally that involve things forbidden in the Lord’s commands. The Burnt Offering regulations are given in verse 8-13. The priests are instructed in verse 9 and 12 to keep the fire burning as a reminder of God’s continual presence and the need for continual atonement for the people’s sins. Jesus Christ offered the final Burnt Offering with His sinless, perfect body. Being wholly consecrated to God, He suffered death for our sins that He willingly took upon Himself, bringing about death to sin for all believers (Romans 6:2-7). The Grain Offering of verse 14 represented the fruits of obedience from the offerer. It foreshadowed the perfect obedience of Jesus Christ as He offered His life in thanksgiving to God. Verses 19-23 are the first mention of the Priest’s Grain Offering that they had to bring on the days in which they were anointed. Their Grain Offerings had to be offered daily whereas Christ offered Himself “once and for all” (Hebrews 7:27). Verses 24-30 go into detail about the regulations of the Sin Offering. Christ offered the final Sin Offering with His perfect, sinless life. We continue to see the person and work of Jesus Christ foreshadowed in this chapter. These sacrifices had to be offered continually because it would only be through the sinless blood of Jesus Christ that the final sacrifice would be offered once and for all (Hebrews 7:27). It would only be through His blood that believers would be cleansed from sin (1 John 1:7). Jesus is our High Priest (Hebrews 8:1), risen and glorified, our Savior, making intercession for us at the throne of God (Romans 8:34). Just like the nation of Israel had to keep from anything that was unclean and defiling, we as believers are told in 2 Corinthians 7:1 to “… cleanse ourselves from all filthiness of the flesh and spirit, perfecting holiness in the fear of God.” Considering all that Jesus went through for us, this surely is our “reasonable act of worship” (Romans 12:1). Heavenly Father, I thank You for the gift of Your Son, Jesus Christ. When I think about all that He endured for me and for the rest of the world, my heart is overcome with love and thanksgiving for His sacrifice that paid the price for all of our sins. Thank You, Jesus, for making intercession for me at the throne of God. Thank You, for Your blood that has been applied to my life and restored my broken relationship with my Father. I pray for Your grace to move through me and empower me to live the holy life that You call me to live. In Your powerful and life-changing name I pray. Amen! 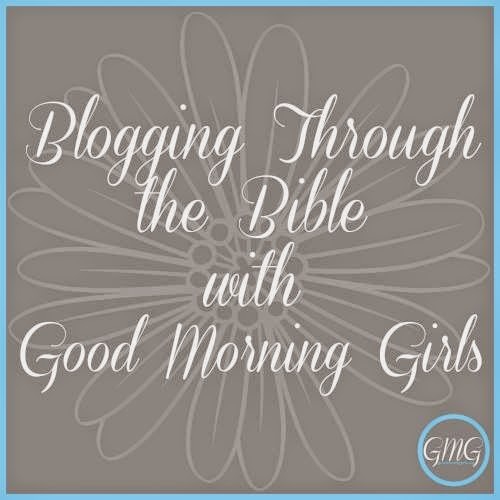 Thanks for reading through the book of Leviticus with me and the Good Morning Girls! Please remember to share your thoughts in the comments below!